Robot rescue! Who should we send into the uncanny valley? Who should we sent into the uncanny valley? I believe anthropologists might be the right people for the job. Wait, what’s an uncanny valley again? As robots become more like humans, the response from humans is positive. But as robots begin to close the gap, suddenly humans react with revulsion. There is something chilling about a creature who is near human but not quite human enough. A vague resemblance is good. Something like perfect identity is good. But in between, when the robot is very like a human but still identifiably different, that’s when we put our foot down. That’s when we get our backs up. That’s when we find repudiating robots and insisting on their exile in the uncanny valley. It turns out that anthropologists are good at the uncanny valley. After all, we spend our time looking at how humans construct and then navigate a world of meaning. So we are alert to the small signals and involuntary communications with which humans inform other human beings about their intentions and inclinations. A lot of this is uncanny in another sense. It’s astounding how good we are at picking up signals that are barely visible. These are the things that robot makers find extremely difficult to program in. To read subtle signals is the work of anthropology because it’s such a big part of humanhood. People who can’t send signals or read them are tragic figures. They are adrift in the very communities that locate and secure the rest of us. They are lost in social space. The rest of us are as satellites constantly sending and receiving GPS signals to figure out where we are relative to every thing and one else. Anthropologists are good at phatic communication. These are the little sounds we give off. A sigh, a groan, a laugh. Phatic communication signals our emotional and social condition. Crucial to human relationships, but tough for programmers because it is in some engineering communities classified as “exhaust data.” (See my investigation of this problem here.) Robots are going to have to give off phatic signals. So we are going to have to consult the anthropologist on this one, not the engineer. Anthropologists are also masters of sprezzatura. This is a big piece of human communications. It consists in the art of learning some social convention and then making it look absolutely natural. This is a matter of concealing art with art, as Castiglione would say. (See by treatment of the idea here.) These social conventions are necessarily hard to see, because the community has deliberately concealed their existence and use. Again, it makes sense to call in the Anthropologist. Anthropologist are good at all the signals that have been deliberately removed from view. One of the reasons that on line meetings (telepresence) has not taken off that many bosses exert their veto power through small signals. For instance, they may signal their disapproval of an idea by leaning back ever so slightly in their chair. Subordinates spot this signal…or perhaps it is better to say they sense it…and the idea is nixed. Again, this sort of thing is generally missing from robot programming. Finally, anthropologists are good at contradiction, at the ways humans entertain conflicting thoughts and emotions, and give off mixed signals. And this contradiction is the sort of thing that offends the very soul of a certain kind of engineer. Of course, you don’t have to be an anthropologist to help out here. Michael Silverstein at the University of Chicago used to talk about people who were simply supernaturally gifted at social communication. Not surprisingly they end up in senior management, in sales, in teaching, in marketing, anywhere where their ability serves them to aid in the task of communications. It’s also probably to that novelists should be particularly useful here. Show runners like Beau Willimon (House of Cards), and Carlton Cuse and Kerry Ehrin (Bates Motel) would be superb as well. After all, they use social signals to help us construct interior conditions and social interactions. So you don’t have to be an anthropologist. But it helps I think if you are. You are trained to understand the uncanny valley. Here’s a very partial list. Apologies to all I have excluded! Ken Anderson, Katarina Graffman, Jane Fulton Suri, Mark Dawson, Charles Starrett, Robbie Blinkoff, Rita Denny, Timothy de Waal Malefyt, Emilie Hitch, German Dziebel, Miriam Lueck Avery, Amy Santee, Richard Wise, Patricia Sachs Chess, Phil Surles, Morgan Gerard, Melissa Cefkin, Susan Menke, to name a few. Ok, a lot. (People missing from this list are going to be so mad at me. Apologies all around.) These people can help us across the uncanny valley. 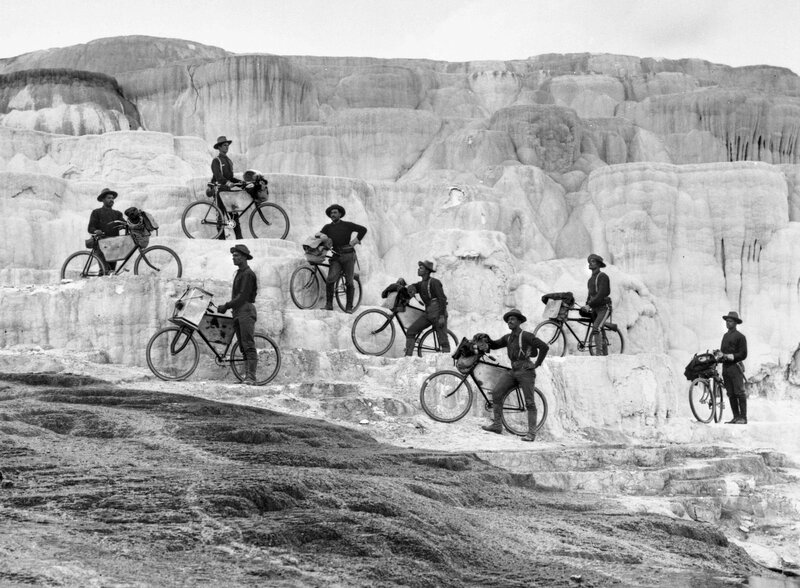 “Bicyclists’ group on Minerva Terrace. [Lt. James A. Moss’s company of 25th Infantry, U. S. Army Bicycle Corps, from Fort Missoula, Montana.] YNP.” October 7, 1896. This entry was posted in Uncategorized and tagged Amy Santee, anthropologists, anthropology, Beau Willimon, Carlton Cuse, Castiglione, Charles Starrett, Emilie Hitch, German Dziebel, House of cards, Jane Fulton Suri, Katarina Graffman, Ken Anderson, Kerry Ehrin, Mark Dawson, Melissa Cefkin, Miriam Lueck Avery, Morgan Gerard, Patricia Sachs Chess, phatic communication, Phil Surles, Richard Wise, Rita Denny, Robbie Blinkoff, sprezzatura, Susan Menke, Timothy de Waal Malefyt, uncanny valley on June 19, 2014 by Grant.